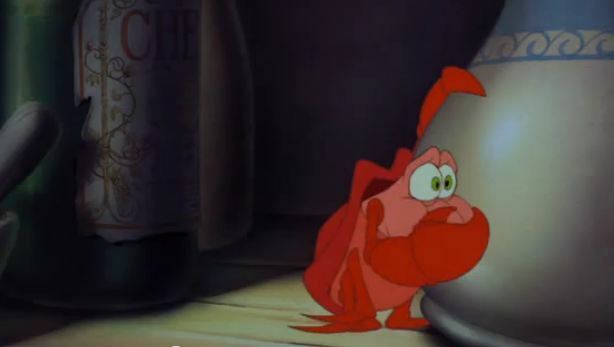 You’re all familiar with the song “Les Poissons” from The Little Mermaid, right? Let’s go with that assumption, since most of humanity has seen that movie. Well, I am what you would call a Sebastian. I can not tolerate being around most fish flesh without getting queasy. It sounds hyper dramatic but it’s totally true. Crab legs? Lobster? Mussels? Cold dead fish with the eyeballs still intact, staring vacantly back at me? My issues with creatures from the ocean center largely around two aspects: how does it smell and does it have a shell? I can’t say that I have never consumed seafood or that I never will again. About once a year I can tolerate a few ice cold shrimp cocktail with cocktail sauce. Caveat: no sauce, no shrimp. If I think about eating a shrimp on its own, ice cold or otherwise, my knee-jerk response is to hold my breath. I’ve said it before and I’ll say it again: I have texture issues. Other things I have tried over the years, whether by force or by choice, are fried calamari (only if the smell isn’t fishy, also no shell) and crab cakes (smell/hint of fishiness will get a thumbs down and with crab cakes, I didn’t have to witness the crab being mutilated). However, watching/hearing crustaceans being cracked open is like nails on a chalkboard for me. Recently, when watching Top Chef, Paul began ripping open LIVE lobsters and I had to cower under a blanket with my fingers in my ears until the scene was over. I was uncertain for a few moments whether I’d keep my dinner down. 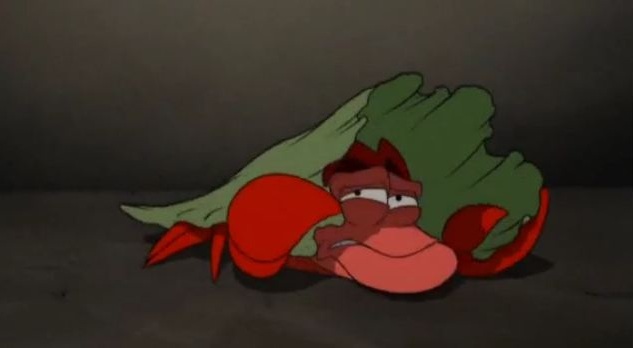 I’m pretty sure I must have been a crustacean in a former life because I just lose it when I have to be around any kind of shellfish and people are smashing/cracking/ripping them open. It’s an intensely physical response where I want to curl up in the fetal position, throw up a little, and then die. I refuse to step foot into a Red Lobster or a Joe’s Crab Shack or anything resembling one of those places. I just don’t “get” having a gigantic crusty thing sitting on a plate in front of you and wanting to rip it open. To me, lobsters are the roaches of the sea. I know–gross imagery. But that’s just how I perceive them. Despite being a grown woman who is well familiar with my senses of taste and smell, I get some strange looks and/or reactions from people when I tell them that I can’t stand fish or seafood and that even the smell makes me lose my appetite. I don’t know if it’s because most people outgrow it or what but some people’s responses have made me feel as if I should get over it or that I must be faking or overly exaggerating. The truth is, I’m really not. Fish just isn’t for everyone. In the same way that I flat out do not understand people who don’t enjoy chocolate or popcorn, I get an occasional incredulous stare when I pipe up during a conversation where a group is deciding where to eat dinner and I have to say, “As long as it’s not only a seafood restaurant.” It makes me wish I were allergic, quite honestly. That would probably go over better. On rare occasions do I wish to be like “everyone else” and enjoy a fresh seafood dish. Visits to coastal cities are wasted opportunities on me when it comes to going to acclaimed seafood restaurants. When I lived in New York, I hated to even walk past a fish shop or seafood restaurant, worried that the smell would follow me, or worse yet, stick to my clothing. And folks, the smell CAN stick to clothing and hair. Prime example: on Valentine’s Day, Kevin enjoyed a seafood dish for dinner. Later in the week, I went to wear the shirt to work, since I had only worn it to dinner. When I put it on, I immediately smelled the remnants of his dinner all over the shirt. It’s lucky I didn’t put the thing in a bucket with gasoline and set it on fire. The shirt survived after I put it in the wash but my brain was screaming from the olfactory overload. Before writing this post, I even tested myself and watched “Les Poissons” on YouTube to see if the images OF A CARTOON MAN KILLING CARTOON FISH would still bother me and I confirmed that my stomach muscles still tense up and quiver when I’m watching and listening to the gutting of non-existent seafood. Sad? Probably. But oh so true. And so, after more than 31 years of detesting even the smell alone of dead/raw/cooked fish, I think it’s safe to say my taste buds aren’t converting anytime soon. That makes two of us! I can eat tuna and the occasional shrimp cocktail, but I’ve never been a fan of seafood. Be sure to mention your loathing of fish to the Gma next time you guys visit. This will be an instant bond. She will eat tuna (canned), salmon (smoked–esp. from Dave McC in Alaska) and does like crab/lobster/shrimp, but only once in a great while. And Top Chef? Opening live lobsters? Seriously? I can’t believe PETA wasn’t all over them. I myself like most fish, but hate it that some sushi-lovers are always telling me “It’s not ALL raw” or “you’ll like it! It’s AWESOME.” If it’s so awesome just eat it all, why don’t you? I’ll have to mention it for sure! It’s a relief to know I’m not the only one. I go back and forth between liking and disliking tuna salad (oddly, my seafood hating brother adores it, so there are exceptions to every rule). I cracked up at your sushi comment–totally agree. Lobsters can’t feel, like all fish! It’s not about pain, it’s about common decency. This post reminds me of all the times I’ve had to tell people I don’t eat sushi. They ask why, and I say because I don’t like fish. Without fail the person will always suggest that I try a California roll because it’s made with fake crab meat, to which I always have to point out that fake crab meat is made of fish, so WHY would I enjoy eating that?!? I know, I’m so overdue! They don’t feel because they don’t have a fully developed brain. They don’t have a brain at all. Well, I am sure that they don’t like HEARING their SKELETONS being CRACKED OPEN.